Captain Triumph returns to the DCU. Who? Right, cuz the Powers That Be at DC Comics these days ignore anything that happened before 1986. Well, Captain Triumph is sort of a cross between Doc Savage and the original Superman from Action Comics #1 (brutally forceful, can’t fly, etc). But how did a Golden Age character end up in Harley’s book? 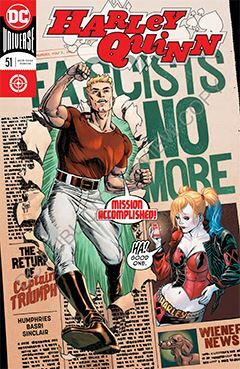 Well, last issue, when she and Jonni DC messed with continuity, the long-forgotten captain somehow got sucked into Harley’s world. He’s dazed and confused, and doesn’t much care for the New York of 2018. Jonni’s got enough of a mess on her hands, so it’s up to Harley to keep the big lug out of trouble until matters can be resolved. I appreciate this title for its ability to not take it – or DC or comics in general – so seriously. Much of what goes on happens with no care or interest in what goes on elsewhere within the DCU. That used to bother me until I realized the entire series is presented through the warped lens of Harley’s own reality. We may some day see it end, and discover it’s all been a daydream while Harley resides quietly in Arkham. But a little bit of Harley goes a long way. It seem as if there hasn’t been a week in recent months that there hasn’t been a Harley-centric book on the stands. I realize she could be the break-out anti-hero – DC’s version of Wolverine – but I do wish they would dial it back. Too much of a good thing is a bad thing.